This year I challenged myself to make all gluten free and dairy free dishes. The reason I did this is twofold, 1. A few of my friends are lactose intolerant and/or gluten free and 2. I like the challenge of coming up with gluten free and/or dairy free recipes that are EVERY bit as good as their gluten and dairy filled equivalents. Most importantly, I wanted to make sure that all of my friends could eat and enjoy every treat. 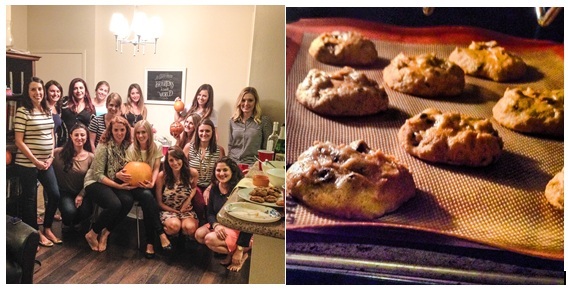 As you know, my favorite Pumpkin recipe is my Pumpkin Chocolate Chip cookies. I couldn’t have a Pumpkin themed party without making a batch, but again wanted to make sure everyone could enjoy, so… here is my gluten free dairy free version. Enjoy! Place small mounds (about 1 Tb.) of dough on prepared baking sheets. – I roll them into balls before placing on the backing sheet. Allow to cool for a couple minutes on baking sheet then transfer to a wire rack to cool all the way.